The building named ’Danube Flower’ was built some thirty-five years ago to become a landmark on Belgrade’s waterfront. It used to house an exclusive restaurant which was a segment of a larger recreational centre accessible to the public. The project was sponsored by the communist government of the time and endorsed by the then ubiquitous president Tito, who was the first guest at the restaurant on 22 November 1973. Serbian 4of7 Architects have defined the Sky Wellness concept suggesting that the place should be light and spacious so that visitors should get an impression of entering a cloud on arrival. In response they have opted for reflective resin floor finishes throughout and a semi-translucent stretched PVC ceiling; both aiming to expose sleek forms of training equipment in the open-plan arrangement.Originally, the building was planned on a grid of 7.3m equilateral triangles which defined its organisational and structural regularity, but with a different brief now they were looking for a change. 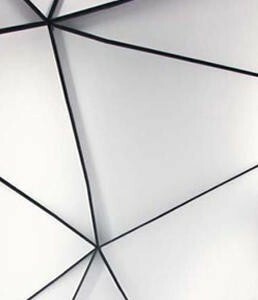 The defining moment of the new spatial expression is the PVC ceiling. Its design is the sequence of geometric transformations and subdivisions applied to the original grid. As a result, approximately 390 backlit panels with the finite variations in shape and size are suspended from the triangular steel construction.